This week’s lunch has been the usual improvisation: What do I have, and how can I combine it so it tastes good? Starting with starches, I almost always have some cooked brown rice on hand, which is the basis for such a wide variety of dishes. Next come vegetables. I have some basics like carrots and celery, as well as loads of kale (it was on sale!) and some raw beets. I also need something proteiny and some flavor. My options were a little limited this week as I had only dry beans and no time to cook them, and very few nuts. I do always have peanut butter and some frozen peas, which I think are the most budget-friendly and convenient sources of protein you can get, aside from lentils and split peas which still have to be cooked. So let’s get cooking! I decided to forgo the peas since I had some in my oatmeal for breakfast, and whip up some peanut sauce. Three birds, one stone: Flavor + protein + healthy fats. 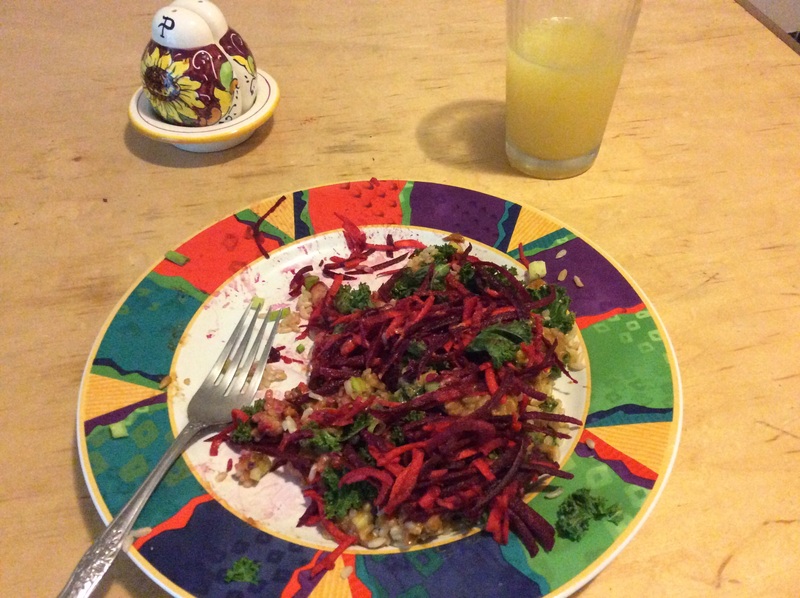 Beets and carrots were quickly run through the grating disk on my food processor and tossed with a few tablespoons of apple cider vinegar and a little salt to make my favorite Easy Beet Salad. I steamed a couple of stemmed and torn leaves of kale in the microwave in my Tupperwave Stack Cooker, but a covered glass or ceramic dish will also do the trick. I simply layered the kale, brown rice and peanut sauce on a plate (use a big bowl, it will be easier to stir), and put a hefty serving of beet salad on the side, thinking it wouldn’t be great with peanut sauce. I was wrong; it was pretty good with peanut sauce. There you go, beets are a peanut butter food! Also topped the whole mess with some scallions, since onions are both delicious and good for your heart. I ate half of it before I remembered to take a picture. Since this is lacking a bean or tofu, I wondered what the actual protein content would be, since folks seem to be obsessed with where vegetarians get their protein. Plugged the ingredients into Google, and based on 1 cup each of rice and vegetables, plus two tablespoons of peanut butter, you end up with around 18g of protein, about a third of what a woman my size needs for the day. Not bad, right? PS – I’ve been eating black bean soup for dinner at work all week. In case anyone wanted the recipe, you can find a version of it here.